Late one February night, with temperatures nearing zero degrees Fahrenheit, I walked beyond the limits of Baotou’s old imperial town to explore one of the most intriguing places I had ever seen in a Chinese city. What are these buildings? Certainly not neat little rows of apartment blocks. 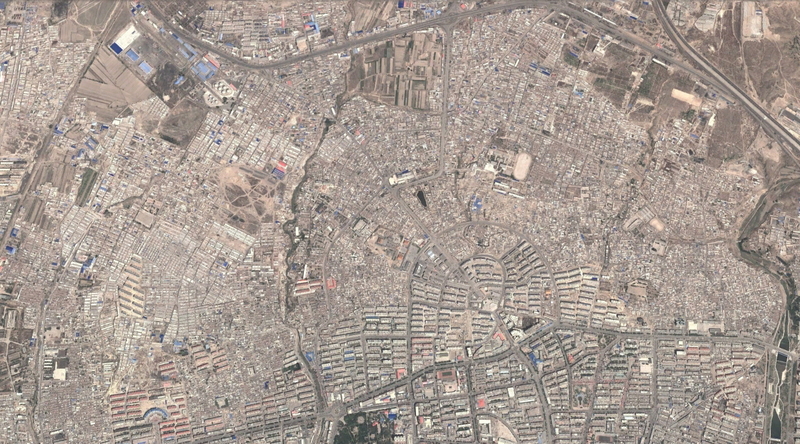 These neighborhoods are much more haphazard and jumbled together. 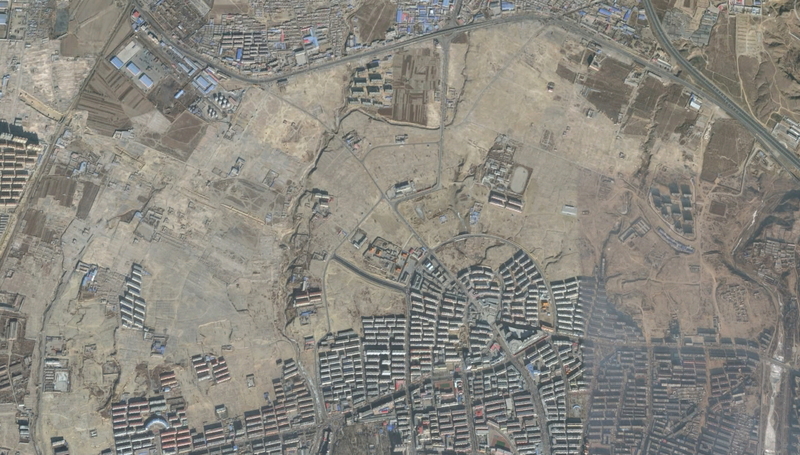 I’m almost tempted to say they look like slums, but China isn’t supposed to have urban slums. The government instituted a housing registration plan in the 1950s aimed explicitly at forcing peasants to stay in the countryside, preventing them from migrating to cities and building slums on their edges. These neighborhoods are scattered all around Baotou’s modern sprawl, and their crazy-quilt appearance calls to mind China’s ‘villages-in-the-city,’ (which I explain in detail here), but those are generally confined to China’s south – I’ve never heard of them popping up on the Mongolian steppe. That was all I was able to observe from satellite imagery and quick glimpses from a moving train. Having finally arrived in Baotou, I had the perfect chance that night to investigate one such neighborhood myself. And one of the largest concentrations of such housing happened to lie just north of the old historic city center. In every direction it looked like the surface of the moon. The entire neighborhood had been demolished and cleared away. 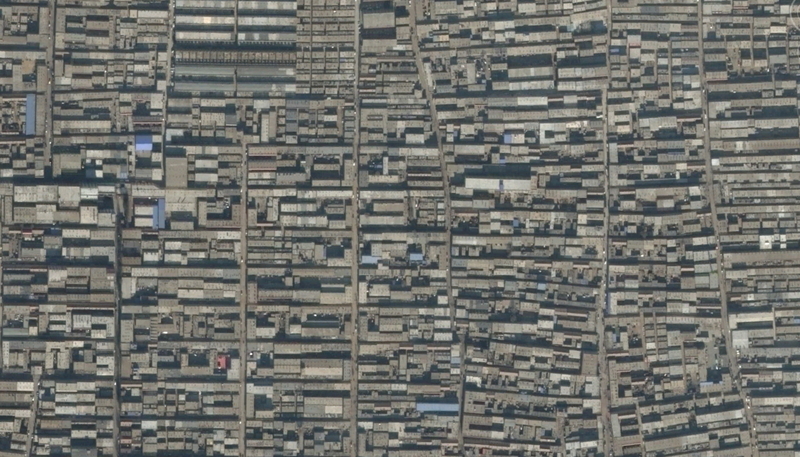 Each billboard contained a satellite image similar to the one I had viewed, with a section of the neighborhood outlined in red and a much larger aerial photo of it having been cleared away. The sign below describes how 5,062 people were resettled in a demolition process that was completed in May 2014, just nine months before. Soon I was so tired and disoriented from stumbling in the darkness that I used my phone’s GPS to navigate back to Baotou’s historic center. I had barely covered a fraction of the cleared area. All gone! The scale of this urban redevelopment is absolutely colossal. Just to give you a sense of how huge this pseudo-slum was before they swept the whole thing away, I used MAPfrappe to superimpose the neighborhood boundary over some more familiar locations. 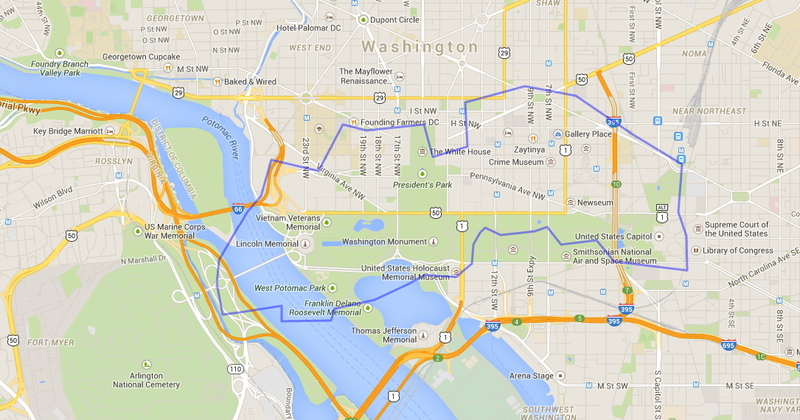 And in the US capital, the cleared area would stretch from Arlington Cemetery to Washington Union Station, engulfing along the way most of the National Mall, all three branches of the federal government, and a decent chunk of downtown DC (not to mention part of the Potomac). 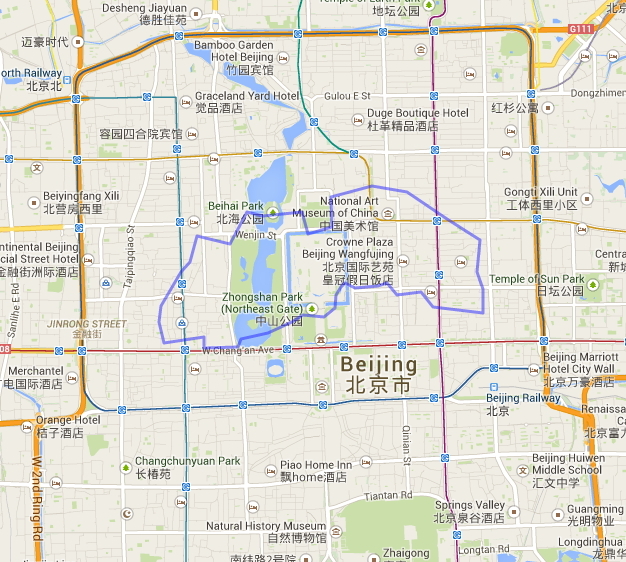 Back in China, we can see that Baotou’s cleared neighborhood is several times the size of Beijing’s Forbidden City, and covers a huge chunk of the Chinese capital’s central area. This last point of comparison is particularly galling. How much attention and ink have we English-speaking writers spilled on the plight of Beijing’s hutong neighborhoods? Meanwhile, in other cities they are sweeping away neighborhoods of equal or greater size without anyone even noticing. And the neighborhood I sought out is far from the only one in Baotou – there are several others of equal or greater size scattered throughout the city. 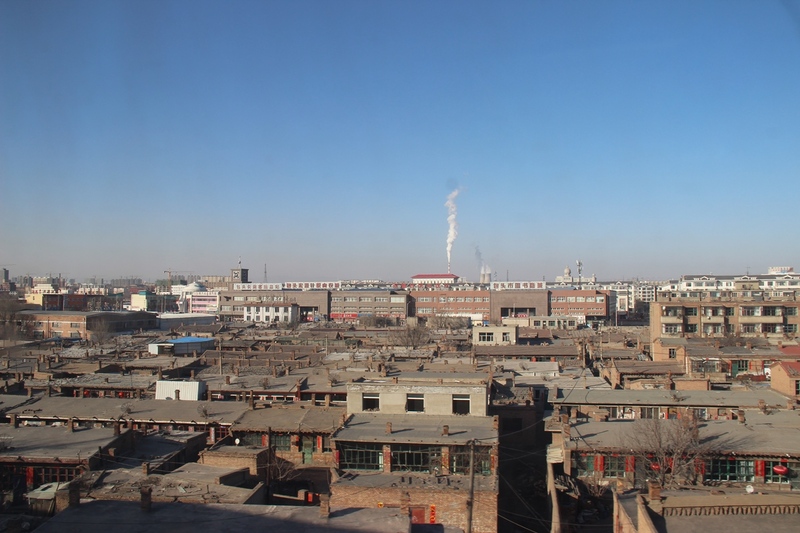 Was the Baotou neighborhood historic? Probably not. The living conditions probably were terrible, and wherever the residents have been resettled is almost certainly an improvement. But do we know for sure? Where are the residents now? Was the clearance and relocation process conducted in a responsible fashion? What will be built in its place? 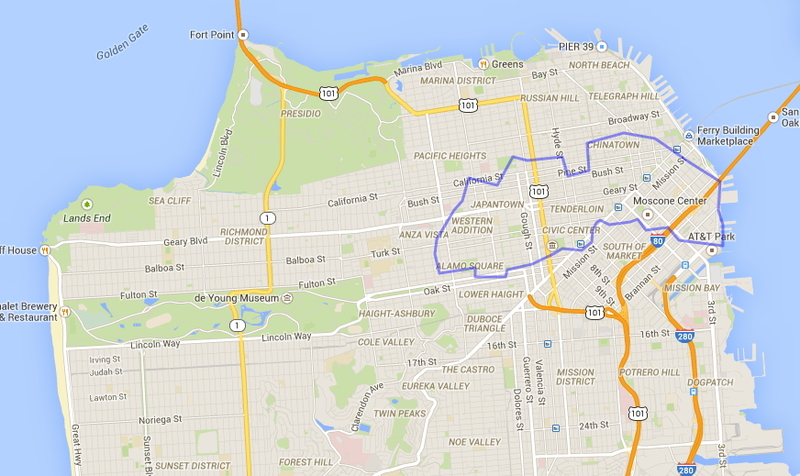 How did these huge neighborhoods get built in the first place? I don’t know the answer to these questions, but would dearly love to find out.